I never, ever, thought about receiving or giving out awards for this blog. It was simply a labor of love, a passion if you will, of my fascination and sometimes addiction to the world of animals. That was until (11/22/2009) when Fisher, one wise and very talented female feline honored me with a Best Blog Award. You can find Fisher at her blog, Ask Fisher, where she dishes out advice to pets and pet owners. She is the feline version of Dear Abby. Now it is my turn to pass out some awards. The blogs listed below are my choices of great well written and entertaining animal blogs. I have separated them into groups. Is yours here? 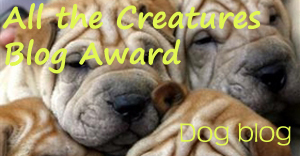 If it is just right click on the award your blog is listed under and copy the award. Link that award badge back to this page so everyone can see where your blog is listed. Of course this award first goes to the little cat that started my award page. I have been visiting Fisher for a long time now and you can even find Fisher on Twitter. This dog blog started off as an experiment for the blog owner to show how to set up a blog. Other people started to visit and now it gets its fair share of visitors.Some funny dog photos on this blog.